Cleans green and makes concoctions for a profit. Task based system that includes cleaning, mixing unfinished potions and making finished potions. The bot will continue through your tasks until they are all finished (will go to a next task if you run out of items or hit your stopping point for that task). Each task gives an option for a stopping point via iteration or level (aka you can say stop cleaning herbs at 60 herb or 5000 herbs cleaned). The default for each is unlimited (i.e. until you run out). Note: This bot makes 3 dose versions of all potions listed below. If there is a potion that will allow you to make 4 doses without an amulet of chemistry (stamina), then support for 4 doses isn't included. You will need to buy supplies to make the 3 dose version. Please post on the discussion thread if you have any problems, or would like to request more features and potions! 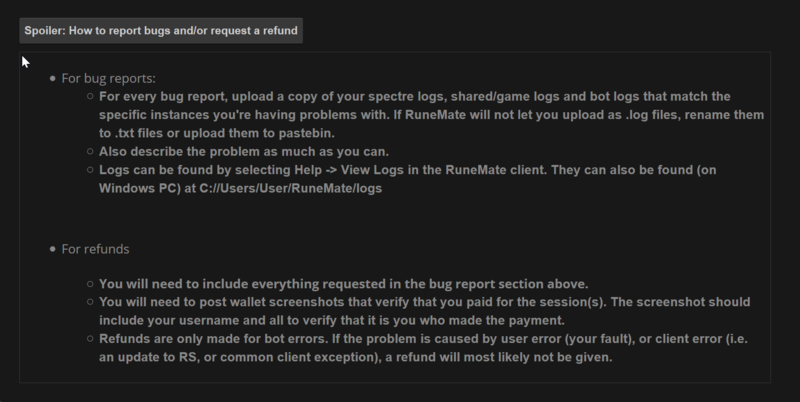 For every bug report, upload a copy of your spectre logs, shared/game logs and bot logs that match the specific instances you're having problems with. If RuneMate will not let you upload as .log files, rename them to .txt files or upload them to pastebin. Also describe the problem as much as you can. You will need to post wallet screenshots that verify that you paid for the session(s). The screenshot should include your username and all to verify that it is you who made the payment. proxi, sreno and Snufalufugus like this. mixing is just way too slow, does the job but like half as fast as a human can do, looses to much effiency for a paid bot. If you're having issues with speeds, then post a bug report. There's a guide in the overview for a reason. Post full logs. Check the overview for how to report bugs. If it says it is out of unfinished potions, then it is out of the ones it is looking for. You're an absolute legend. That's it. End of story. there's a bug report section in the overview. read it. follow the directions. its so slow at doing anything lmao, it's like being on a premium hotline and they keep you on hold.